Pack, Snack and Go Anywhere! chips or other sides at lunchtime. It can even hold a full meal for toddlers! throw it in the dishwasher for a super-simple cleanup. covers are even BPA-free and add a splash of style! Our Customer Service Team is Standing By to Handle Your Questions! Order Your Trio Now and Snack on the Go! GREAT FOR EASY SNACKS: At 6" x 5" x 1.75" and featuring three compartments, our Trio 2 storage containers are the perfect size for nutritious snacks and finger foods! Kids and adults can use it for their favorite sides at lunchtime, or it can hold a full meal for toddlers. PORTABLE CONVENIENCE: From deviled eggs at a picnic to fresh fruit and nuts on a hike, these are the best food storage containers for traveling, family car trips or snackers on the move! The Trio 2 was designed for variety, however, because the lids and dividers aren't watertight be sure to pack only dry foods. 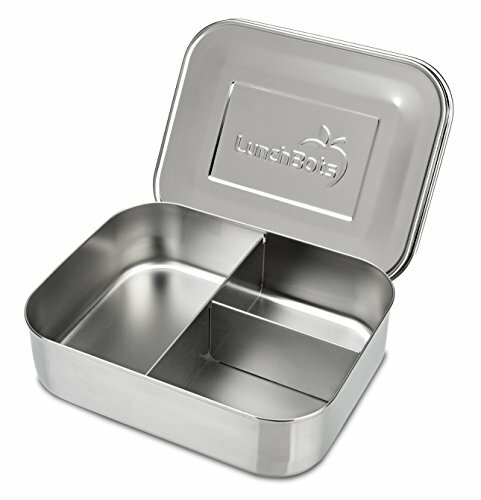 SAFE AND DURABLE: Made from the highest quality 18/8 stainless steel, this is the best snack tray for packing healthy food to go. Even with our colorful dot covers, 18/8 stainless steel is all that touches your food. And because they're virtually indestructible, they're great for any on-the-go lifestyle. DISHWASHER SAFE: For a super-simple cleanup, just toss your Trio 2 and lid in the dishwasher. TRUSTED BRAND: With our expertly crafted boxes, bags and containers, the LunchBots team takes the hassle out of mealtime! We know you'll love our lunch boxes for adults and kids, but if you have any questions, let our customer service team know. If you have any questions about this product by LunchBots, contact us by completing and submitting the form below. If you are looking for a specif part number, please include it with your message.